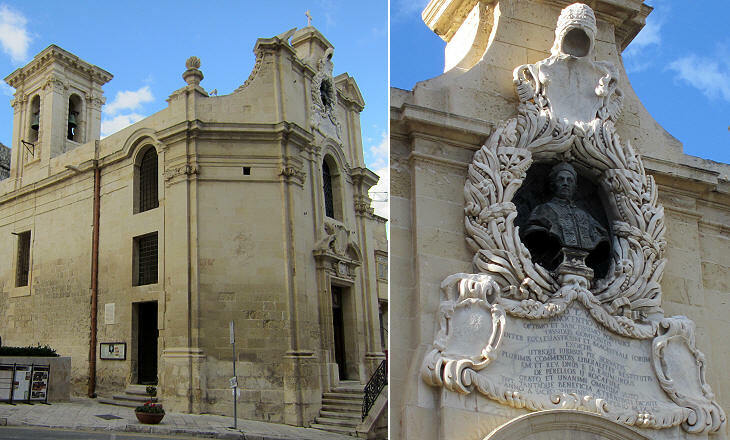 In 1573 Grand Master Cassière decided to build a conventual church for the Knights at Valletta; it was dedicated to St. John the Baptist, the patron saint of the Order. Cassar designed a façade which conveys a feeling of strength, as if it were a military facility. Luckily only minor changes were made to the façade in the following centuries and the building was spared by WWII bombings. 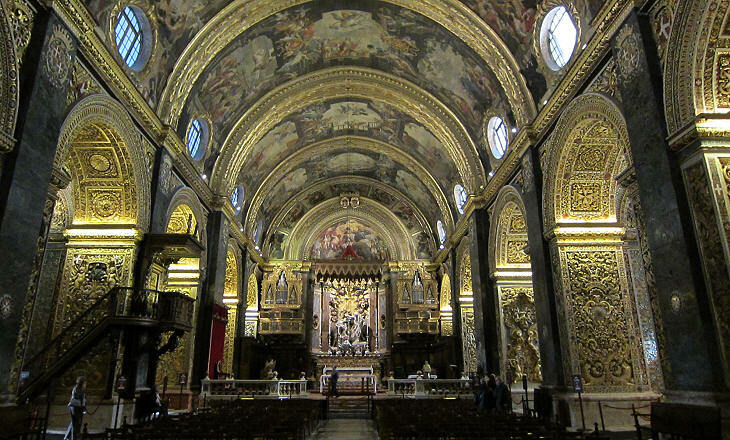 In 1814, after the Knights had left Malta, the church became the Co-Cathedral of the diocese in addition to St. Paul's at Mdina. The interior of St. John's combines the neat architectural structure designed by Cassar (one large nave with side chapels, but without transept and dome) with the elaborate decoration which was added in 1660-80 by Grand Masters Rafael and Nicolas Cotoner. The Grand Masters and some of the most important Knights were buried in the church; initially in the crypt and after the redesign of the interior in the chapels. 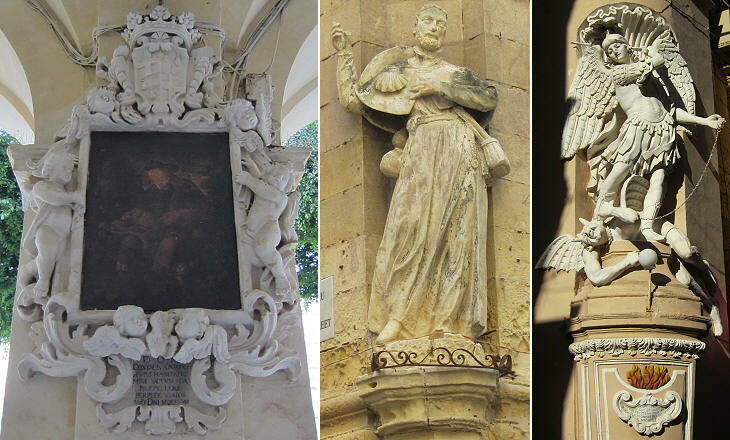 Details of some of the funerary monuments and of the chapels can be seen in the pages covering the history of the island: Chapel of Aragon, funerary monument of Grand Master Martin de Redin, funerary monument of Grand Master Annet de Clermont, Chapel of France, funerary monument of Grand Master Marcantonio Zondadari, portal of the Oratory and funerary monument of Grand Master Rohan de Polduc. In 1661 Rafael Cotoner commissioned Mattia Preti, an Italian painter, the decoration of the entire vault of the church with scenes from the life of St. John the Baptist. Preti was a renowned painter who had worked for some thirty years in Rome, Naples and other Italian locations. 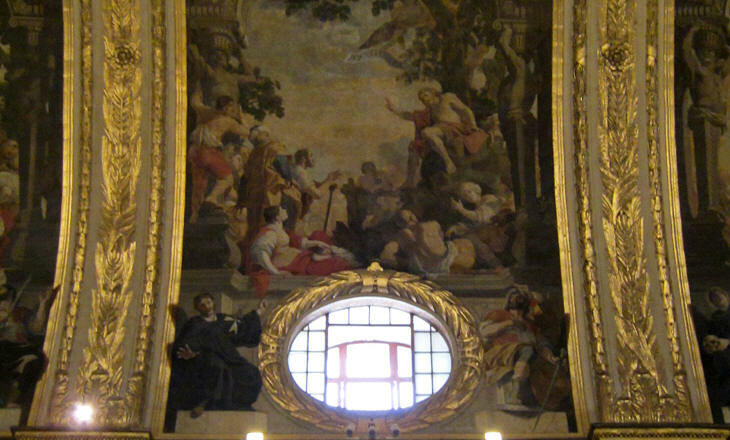 He had experience in large decorative paintings as he was commissioned three large frescoes for the apse of S. Andrea della Valle by Donna Olimpia Maidalchini, sister-in-law of Pope Innocent X.
Preti discovered that oil colours could be directly applied on the Maltese limestone of the vault. The use of this technique allowed him to utilize a wide range of colours and to make changes more easily. In five years he painted eighteen episodes of the life of St. John the Baptist. The Knights commissioned him many other paintings for the chapels and for other churches. Preti never left Malta where he died in 1699. 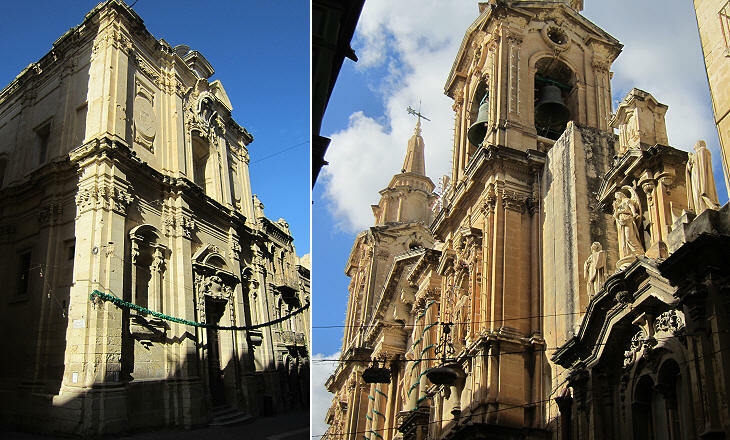 Our Lady of Victories is the oldest church of Valletta and it was designed by Laparelli and Cassar at the request of Grand Master Valette to celebrate the 1565 Great Siege of Malta. A lengthy inscription explains why Grand Master Perellos placed a bust of Pope Innocent XII on the façade of the church in 1699. The pope settled dissidiis (..) inter ecclesiasticum et magistrale forum, a quarrel about the jurisdiction of the Grand Master and of the Bishop of Malta. This type of decoration made up of a bust, a long inscription and an elaborate background relief can be observed on other buildings such as the Auberge of Italy at Valletta and the main gate of Cottonera Lines at Bormla. St. Catherine's, the church of the Italian Knights stands opposite Our Lady of Victories and it was built a few years later. The portico however was added in 1713 and it was designed by Romano Carapecchia, an assistant to Carlo Fontana whose only work in Rome is the new façade of S. Giovanni Calibita. St. Catherine's, Our Lady of Victories, Auberge of Italy, Auberge of Castile and St. James' Cavalier make up a very interesting example of late XVIth century architecture. 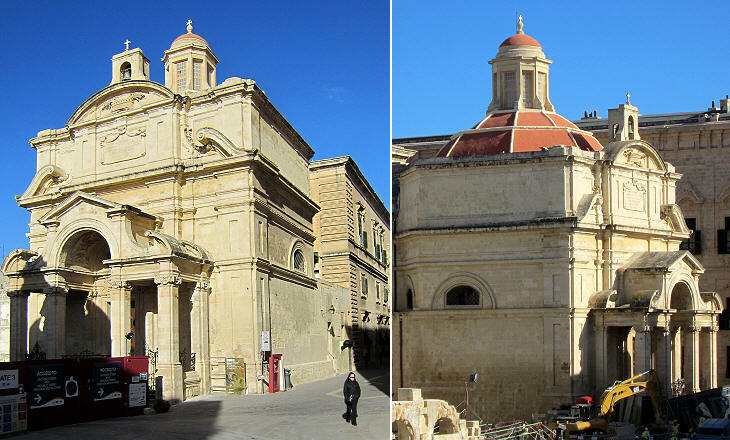 In January 2012 a new large real estate development, although not directly affecting these monuments, appeared to be threatening this historical corner of Valletta. Laparelli and Cassar gave Valletta a very regular urban layout which however did not provide for large squares. The streets were relatively wide, but the churches which were built along them were enlarged and heightened in the following centuries, thus impairing a proper view of them. 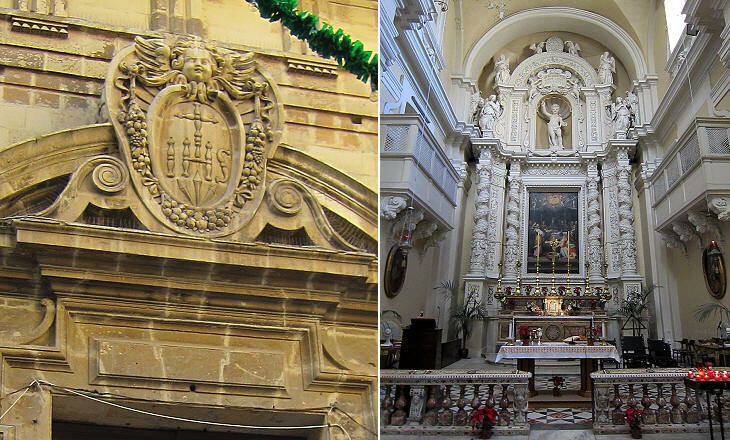 St. James', the church of the Castilian Knights, was modified by Giovanni Barbara in 1712; St. Paul's Shipwreck by Nicola Zammit in 1885 (February 10, the Feast of St. Paul's shipwreck on Malta in 60 AD is a public holiday). The Knights belonged to a religious order, they took vows of celibacy, poverty and obedience, but they were not entirely happy about other religious orders settling in Valletta, which they regarded as "their backyard". The Jesuits, however, were so powerful that Grand Master Verdale could not avoid the construction of a large Jesuit College as this was requested by Pope Clement VIII in 1592. Its church, similar to other buildings of the Order, shows an abundance of decoration. 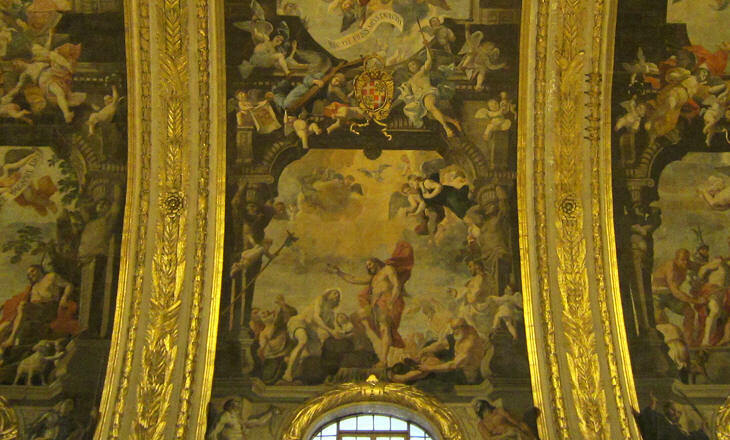 The great monogram having on top the head of a cherub is typical of Jesuit churches after it was placed on the façade of il Gesù in Rome. The Dominicans were the first to establish themselves in Valletta; this because of a 1571 bull by Pope Pius V who belonged to that order. 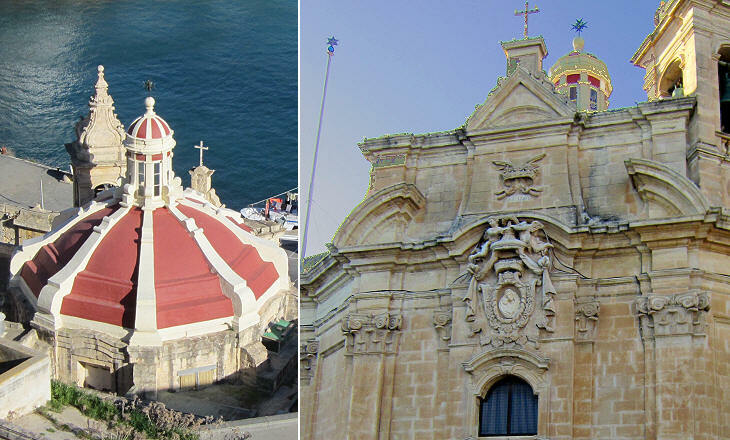 Red domes with white ribs are a characteristic of many churches of Malta even of those which were built in the XIXth and XXth century. 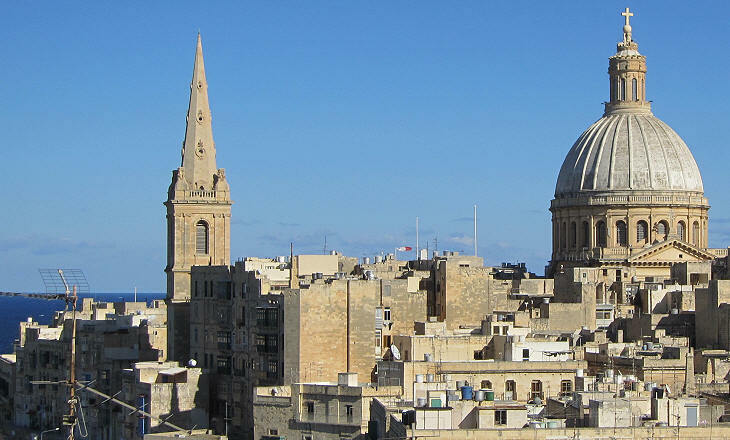 In general the dedication of Maltese churches does not raise questions. Our Lady of Liesse which was built by the French tongue calls for an explanation. Liesse is a village in northern France where a sanctuary housed a wooden statue of the Virgin Mary and Child which was thought to have saved French Crusaders. The statue was destroyed during the French Revolution. The hotel district of Malta is located in Sliema on the northern side of Marsamxett Harbour; the view of Valletta tourists have from their rooms is characterized by a large dome and an adjoining bell tower. They belong to two different churches and have nothing to do with the Knights. 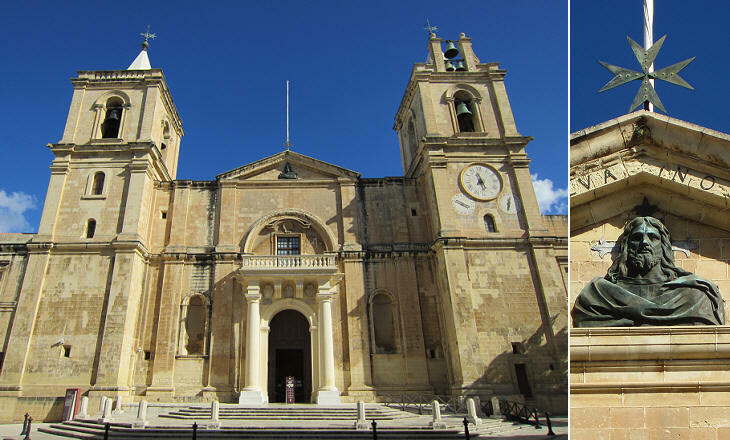 Queen Adelaide spent the winter of 1838/39 on Malta and she was amazed to discover that after almost forty years of British government, the island did not have a proper Anglican church. She made a donation and personally laid the foundation stone of a new church dedicated to St. Paul before returning to England. The dome of Our Lady of Mount Carmel was built after WWII. It replaced a much smaller dome. 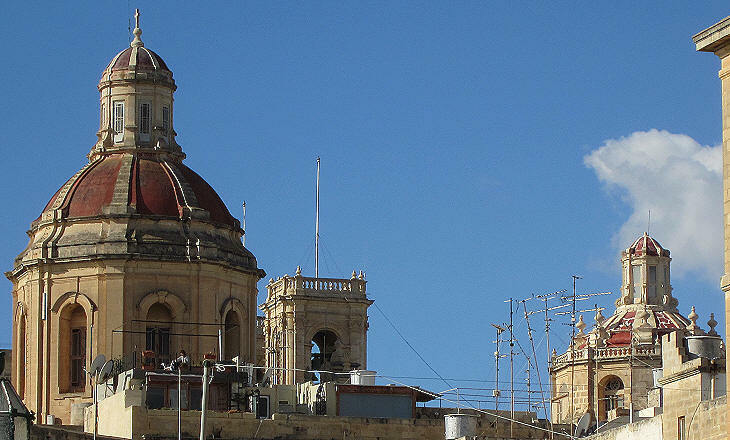 The inhabitants of Valletta wanted such a large dome because their town, notwithstanding its being the capital of the island, did not have a dome comparable in size to those built in many small Maltese towns in the late XIXth century or early XXth century.